Since we are going Pumpkin Picking this morning I thought that this recipe was completely appropriate! Plus, I love pumpkin! I can eat a whole pie by myself. I know I shouldn’t but they are that good! 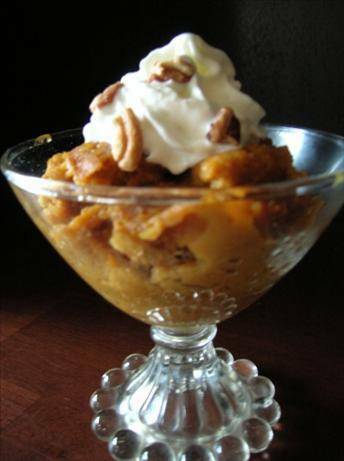 🙂 This Pumpkin Pudding is like a pie in a crockpot. How can you go wrong? Combine all ingredients in a mixing bowl. Using an electric hand-held mixer at low to medium speed, beat ingredients together until smooth. Are U sure it’s a scant Tablespoon of pumpkin pie spice it seem like an awful lot? Just checking. I made the recipe exactly as written. Used Gluten free baking mix from Aldi. YUMMMM. Had the crock pot on warm for about 15 min before adding mix then turned it to high for about 1 3/4 hours then on to low to finish cooking. Didn’t want it to burn edges. Total cook time about 4 hours. My pot gets a bit hotter than most I think, because its oval?